The movement of personnel between employment in the public and private sectors, referred to as the “revolving door” phenomenon, raises particular attention in the context of the response of governments to the financial and economic crisis. 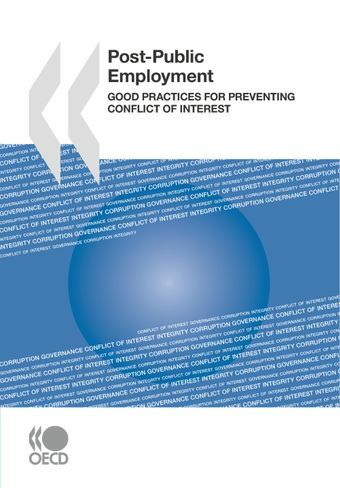 This OECD survey of 30 member countries shows that the vast majority of countries have established basic standards for preventing post-public employment conflict of interest. But few have tailored these standards to address risk areas and professions such as regulators or public procurement officials. Enforcing standards and imposing suitable sanctions remains a challenge for many countries. The principles presented in this volume serve as a point of reference for policy makers and managers to review and modernise post-public employment policies. It is part of the pathfinding efforts of the OECD to promote public sector integrity for cleaner, fairer and stronger economies.